*Multi-Day Discounts available, please inquire for these rates. Discounts are not applicable for packing fees or shipping costs. All of our rentals are available locally or can be shipped to your location in the continental United States to receive the day before your event and return the day after. We waive the transit days and only charge for the days of use. Beyond the Bay Area? Our event gear can be shipped to other cities for rentals. The Pro frame was designed with a detachable feature that allows us to ship it at reasonable rates while being easy to setup. For out of town rentals, we package and ship the Fender Blender Pro, Spin Art, and Ice Cream Bike to you, so they arrive the day before your event, then you ship them back the day after your event. Recharge Stations and sLEDgehammers arrive two days before your event, then you ship them back the day after your event. Instructions and return shipping labels are included. Additional practice days are available at $100/day. The cost of shipping both ways can be anywhere from $130 – 800, depending on the activity of choice. Packaging fees are of $85 – 120, depending if you prefer to received the unit(s) boxed (requires assembly), or pre-assembled on a pallet. We charge a distance fee when a bike is going to be gone from our shop for long periods (such as East Coast rentals). No one is responsible for bringing as many Bike Blended Smoothies into the world as Rock The Bike. We invented the Fender Blender, the only bike blender on the market. 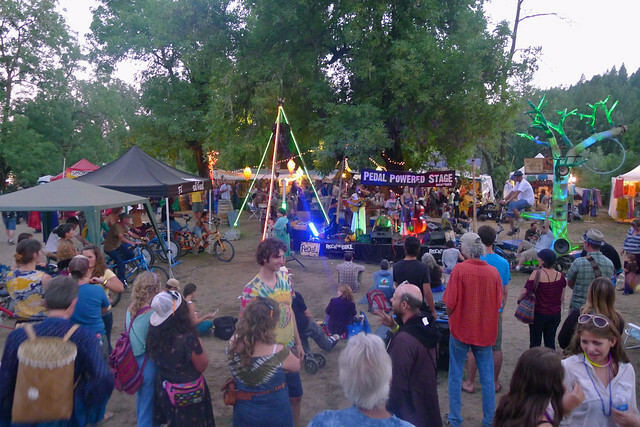 We have successfully produced all-day smoothie booths at festivals such as Whole Earth Festival, Maker Faire, Pedalfest, and Harmony, and we regularly blend at our Pedal Powered Stage music events to keep the pedalers happy and cool during peak moments. 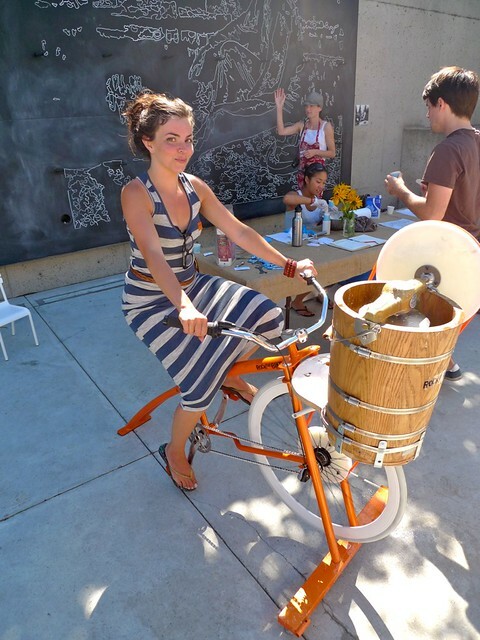 A Bike Blender makes a huge impact at your event. The sound of ice crushing is a great head turner, and research shows that pedal power makes smoothies taste better. Rental cost is $300 / day without Rock the Bike crew. It comes with a commercial-grade High Performance blender pitcher, either Vitamix or Blendtec. Extra pitchers can be rented for $20 per event day. 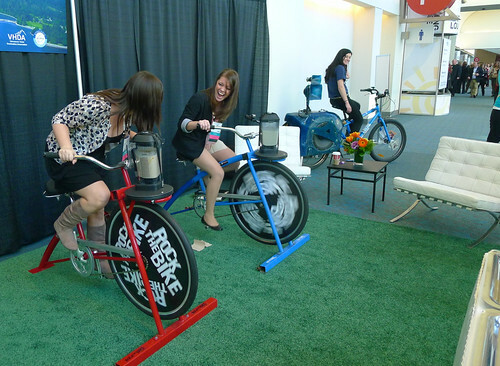 We recommend at least two pitchers per bike to run smoothly, and allow maximum people to pedal! Rock the Bike does not provide cups or ingredients for rentals, but we do offer shopping lists and recipes to reference. We estimate the cost of ingredients to be $1 per 12 oz. smoothie. Our event clients most commonly rent the Fender Blender Pro and man their own blender stations. Rock The Bike can also help you with a fully staffed smoothie station. If you want a Rock The Bike crew member to be there coaching this activity at your event, the crew fee is $900/day*, plus $600/day* for each additional crew member. Our crew will make sure the smoothies are tasty, the bike is working properly, and that many event participants get a chance to take part. The cost of crew does not include the rental fee or cost of ingredients. *Day rate assumes crew is on site for 8 hours or less. Fender Blender Bike Blenders are also available for purchase from Rock the Bike, starting at $249. Ready to Book a Reservation? Click Here! Great for smaller kids, who will be able to power the experience for each other. 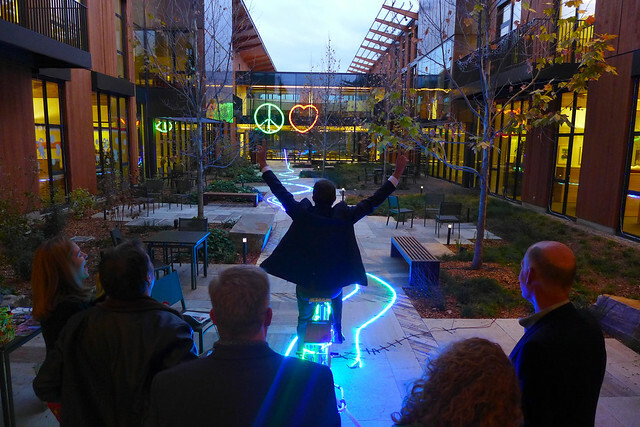 Spin Art is interactive, colorful, creative, peaceful, and inspiring. 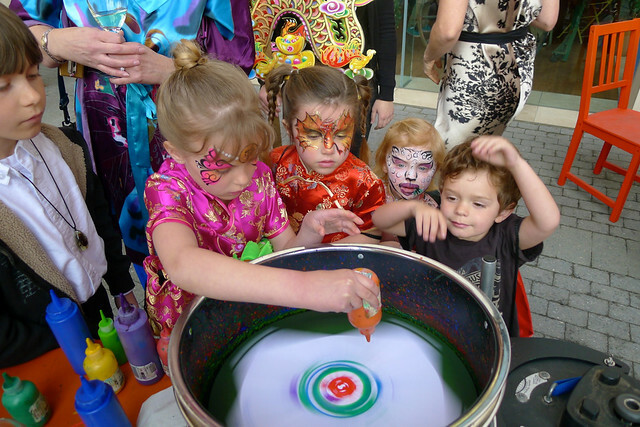 With just a few pedal strokes, you can get the platter of your Pedal Powered Spin Art station spinning at 5000-10000 RPM, enough to produce dazzling spirals, circles, and streaks as you squirt paint on the paper. Kids flock to the station, staring in awe as the colors spin and splatter across the paper. Older kids or parents can pedal for youngsters. Children as young as seven can enjoy this activity. Let them bring home artwork and memories from your event! Are you planning to host a long event, or do you expect hundreds of participants? If so we can provide you with refill paint to keep the activity going. Additional paint is $50 for 1 – 2 Spin Art Bikes, or $100 for 3+ Spin Art Bikes, + increased shipping cost. Alternatively you can hire a Spin Art Station $1,250 / day for paint, paper, and one Rock the Bike crew member. For high-volume events additional crew members are $600/each. If your event is beyond biking distance there will be a transportation fee. If your event is not driving distance from the Bay Area there will be additional crew fees for travel, room + board. Bike Powered Ice Cream Maker. We’ve seen the power of the Fender Blender, and we’ve kicked it up a notch. Serve up ice cream at your event, and allow guests to make their own flavors. 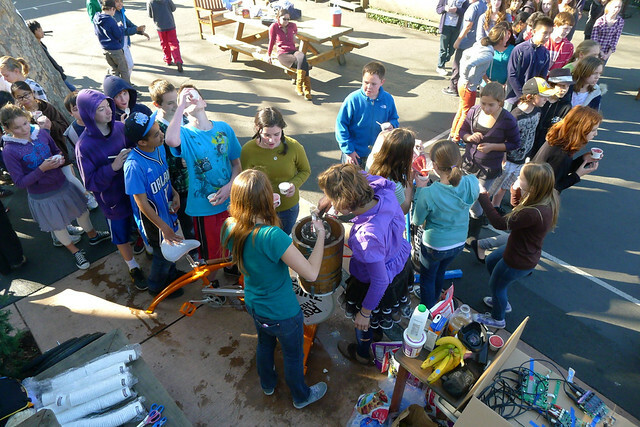 The container has a 1.5-gallon capacity and takes about in 30-45 minutes to churn. The bike fits ages 12 and up. The 1.5 Gallon container can make up to 144 scoops of ice cream per batch! Approved partners can rent the Ice Cream Bike without crew members for $480 / day. Also available to rent through Ample Hills Creamery in Brooklyn, New York. 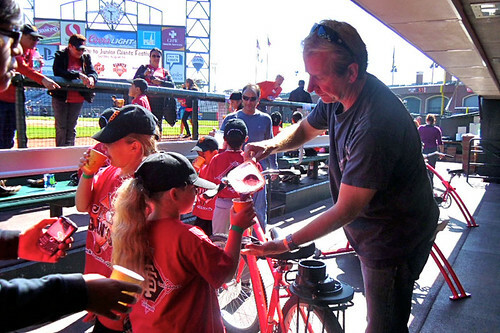 Or you can hire a 2 person Rock the Bike crew to serve up sweet treats in the Bay Area for $2,000 / day. If your event is beyond biking distance there will be a transportation fee. If your event is not driving distance from the Bay Area there will be additional crew fees for travel, room + board. Ingredients for custard, mix-ins, ice, and rock salt not included. Recipes are available through Rock the Bike. We estimate servings to cost ~$1 / person, but this depends on serving size and if you use organic ingredients. Custard must be prepared and chilled prior to the event. Also compatible with Frozen Yogurt, Sorbet, and no-cook recipes! Pair with a Fender Blender Pro and make milkshakes at your event. Above: An Instagram photo of Recharge Stations at a recent event in San Francisco. One person can easily generate the power to charge up to 8 USB devices using our Pedal Powered Recharge Station. Great for conventions, meetings, and all-day events where people need power for mobile devices. 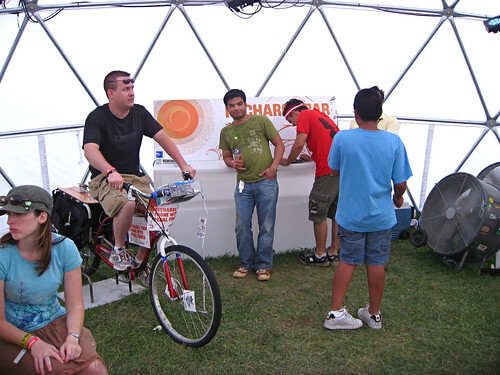 Rock The Bike’s recharge station rental based on a Generator Pro, which features a wide range to fit men, women, and most kids (age 5+). Rental cost is $600/ day per unit without Rock the Bike crew. Each unit comes with 1 Generator Pro, 1 Recharge Desk, and multi-use USB-based charging cords (compatible with iPhones and Androids) and all necessary electrical cabling. Alternatively you can hire a Recharge Station with one Rock the Bike crew member for $1,500/day*. For high-volume events additional crew members are $600/each. If your event is beyond biking distance there will be a transportation fee. If your event is not driving distance from the Bay Area there will be additional crew fees for out of town travel, room + board. *Day rate assumes crew is on site for 8 hours or less, including load-in, set up, and strike. 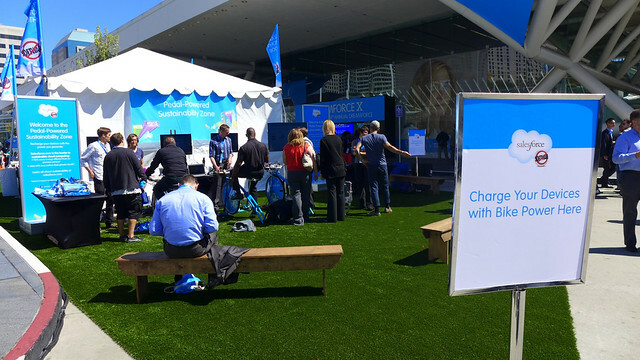 Above: The Pedal Power zone at Dreamforce allows convention attendees to calculate their wattage output while charging electronic devices. Don’t limit your possibilities to cell phones. Power a laptop and speaker and let the pedaler choose videos and web content to share with a small group. Above: Folks gather around the Recharge Station to share information at IBM’s Insight conference. Available to include a DJ Rig, too. Please call us (1-888-354-2453) or email (info@rockthebike.com) to talk to our electronics department about amplified music while charging USB devices (what we call a Knowledge Portal). The sLEDgehammer is an interactive light challenge that harkens back to the classic carnival Sledgehammer game. But here, the aim is to convert your peak power output to a beautiful light display. Pedalers must overcome the challenge phase in order to see the reward sequence. The challenge phase consists of turning on various levels of light. As the pedaler passes the various voltage targets, more and more lights turn on, making it harder and harder to increase the system voltage. If they beat the challenge, they win the game. Their stored energy is then used up in a dazzling display of light. No additional power is needed for the entire activity, although connecting a laptop to the circuit provides additional info that can improve the educational possibilities. – the sLEDgehammer circuit, which comes complete in a strain-reliefed enclosure with an Ultra Capacitor and the all-important Difficulty Knob. Rental cost is $700 / day per unit without Rock the Bike crew. Each unit comes with 1 Generator Pro, 1 sLEDgehammer light tower, 1 power-analyzing circuit, and all necessary electrical cords. The dual sLEDgehammer is a side-by-side competitive sLEDgehammer. It converts 100% of the riders’ muscle power to light and feels harder as more light stages turn on. The rider who sustains the highest Wattage level for 3 seconds and reaches the victory sequence first is the winner. Click here to read more about the dual sLEDgehammer. Rental cost is $1,500/ day without Rock the Bike crew and comes with 2 Generator Pros, 2 sLEDgehammer light towers, 1 power-analyzing circuit, and all necessary electrical cords. Alternatively you can hire a Rock the Bike crew member for $950/day*, or 2 crew members for $1,550/day* for high-volume events. This rate does not include a transportation fee. If your event is not driving distance from the Bay Area there will be additional crew fees for travel, room + board. *Day rate assumes crew is on site for 8 hours or less, including load-in, set up, and strike. 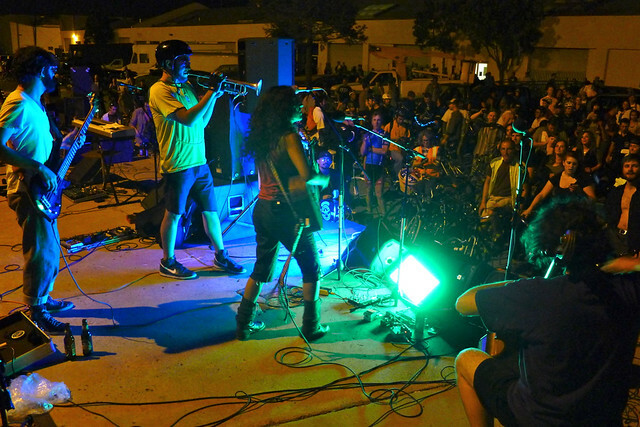 If you truly want to showcase human power in its most social form, getting your event participants to power up a band, street performer, speaker, or DJ is probably the most powerful example there is. Bringing the Pedal Powered Stage to your event is a more significant effort, requiring a larger crew. We have full audio packages for Pedal Powered Stages. 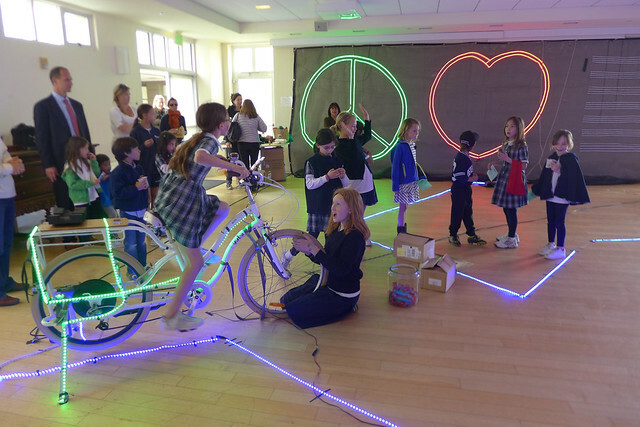 Let us bring our years of experience with pedal powered lighting to craft something special for your event. Below: Youngsters at Hamlin Elementary School see their work become energy with the sLEDgehammer. Below: A custom sLEDgehammer courtyard installation. 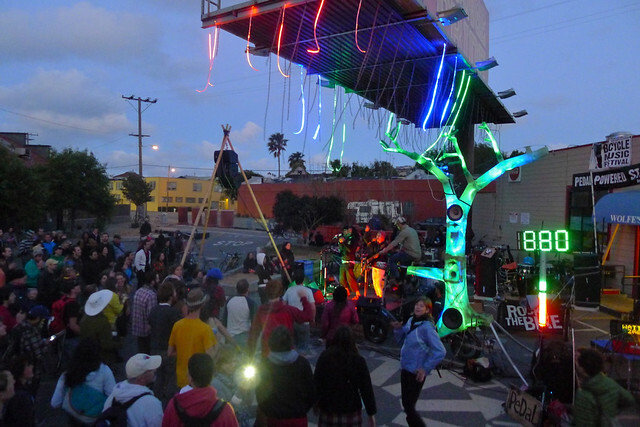 See more examples of interactive Pedal Powered Lighting Rigs. Submit the form below to see if we can accommodate your event. If so, we’ll get you a Rental Agreement, Credit Card Authorization Form, and request payment in full. Bikes are rented on a first come, first served basis. We recommend contacting us as soon as possible to lock in your rental. We look forward to hearing from you!